What are the steps in working on a photo? Next we digitally edit your photo. 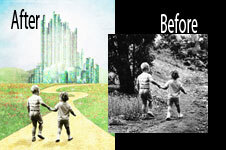 Last we print your photo and give you a CD with your digital repair (cd free on order $20 or more)..